"No cans here! 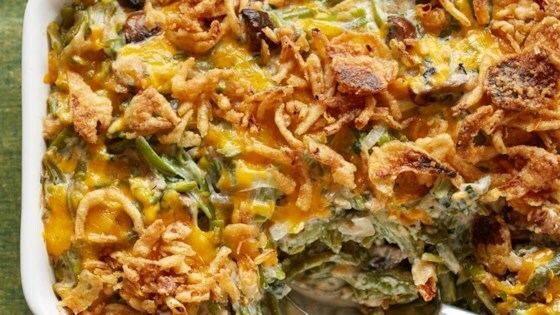 Fresh mushrooms, onion, and herbs with frozen green beans, sour cream, and cheddar cheese make this a delightfully tasty twist on the traditional casserole. I developed this recipe, longing for a 'no cans' version of the classic dish. I made this one year for my husband's family at Christmas time, and now they ask for it every year! My husband asks me to make it for dinner throughout the year." Place green beans into a saucepan and fill with about 1/2 inch of water. Bring to a boil and steam until beans are tender but still bright green, about 5 minutes. Drain and toss with the mushrooms. Set aside. Melt the butter in a large skillet over medium heat. Add the onion and parsley; cook and stir until onion is tender. Whisk in flour until blended, then mix in the lemon zest, salt, and pepper. Gradually whisk in milk, stirring constantly, so that no lumps form and then stir in sour cream. Warm over medium heat until the sauce begins to bubble. Dump in the green beans and mushrooms, stirring to coat. Remove from the heat and toss briefly with some of the Cheddar cheese and French fried onions, saving some of each to sprinkle over the top. Spoon into a 1 1/2 quart casserole dish and top with the reserved onions and cheese. Bake in the preheated oven until the cheese melts, about 15 minutes. I will never make this again. The sour cream was too overpowering (and we love sour cream!). The lemon was a little much. This is so much better than the original recipe. I sauted the mushrooms with the onion and parsley and added 3 tablespoons of ranch dressing. It was a big hit for Thanksgiving dinner. I made this for Christmas dinner and it was a major hit. I didn't put the cheese on top as I didn't have any but everyone wanted to bring the rest home..and wanted the recipe. Thanks! Great flavor. I really enjoyed it however if you don't like crunch green beans then cook them longer than what she states. Otherwise extremely easy and tasty recipe.